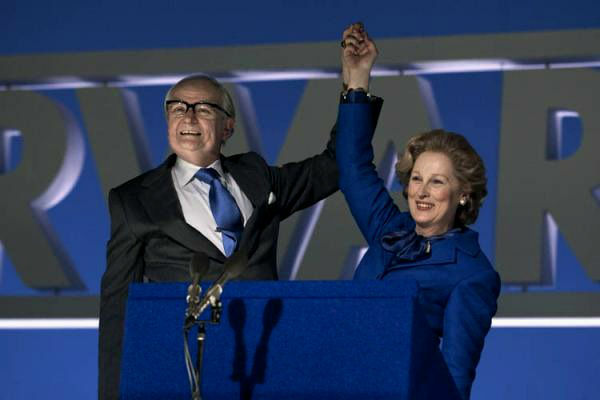 ‘The Iron Lady.‘ Meryl Streep’s performance as Margaret Thatcher is one of the best of the year, but unfortunately it’s in service of a biographical portrait that offers only a hazy outline of the life of the former British Prime Minister. (Landmark Magnolia.) Not recommended. ‘The Divide.’ Michael Biehn leads a cast of survivors hiding out in a bomb shelter after a nuclear attack. (Landmark Inwood.) My review at Twitch. Not recommended. ‘Carnage.’ Roman Polanski’s dramatically-charged adaptation of a very funny stage play stars Jodie Foster, Kate Winslet, John C. Reilly, and Christoph Waltz. (Landmark Magnolia.) My review. Recommended. ‘In the Land of Blood and Honey.’ Angelina Jolie’s directorial debut is unflinching and infuriating in its depiction of Man’s humanity to women during the Bosnian War. (Angelika Dallas.) My review. Recommended. ‘Beauty and the Beast 3D.’ The modern Disney classic looks splendid on the big screen, though the 3D effects add little to a nearly-flawless musical. Highly recommended. ‘Contraband.’ Mark Wahlberg stars as a criminal gone straight who must dip back into the smuggling business to save his brother in a thriller that’s better than expected. My review. Recommended. ‘Joyful Noise.’ Queen Latifah and Dolly Parton star in a Christian-themed gospel musical comedy that preaches to the conversative choir. My review. Recommended for lovers of modern gospel and conservative values.